LUNÄ is now located at the head quarter of Enough Room for Space, attracting a wide range of artists, curators and academics, driven by the same lunar impulse to raise hard questions and consider radically different ideas as to what the future might hold. 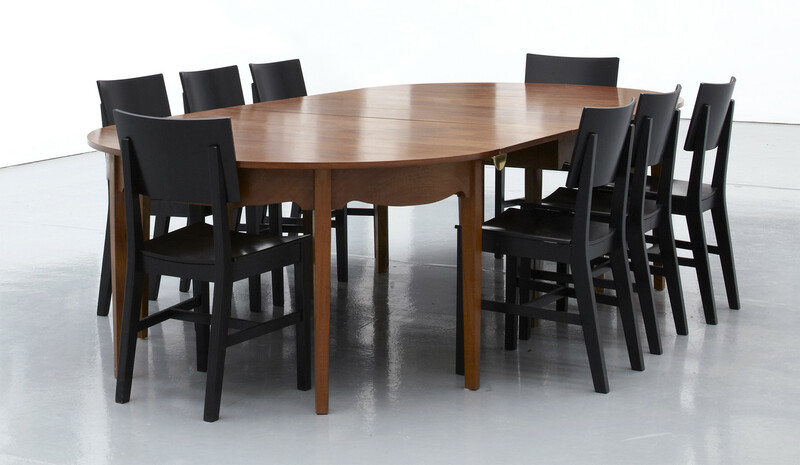 LUNÄ will be used for upcoming projects at the ERforS HQ as a regular meeting and dinner table. LUNÄ is based on the Lunar Society of Birmingham, which was formed from a group of amateur experimenters, tradesmen and artisans who met and made friends in the Midlands from 1765 till 1813. The original Lunar men gathered together for lively dinner conversations, the journey back from their Birmingham meeting place lit by the full moon. Members included the larger than life Erasmus Darwin, the flamboyant entrepreneur Matthew Boulton, the brilliantly perceptive engineer James Watt whose inventions harnessed the power of steam, the radical polymath Joseph Priestley who, among his wide-ranging achievements discovered oxygen, and the innovative potter and social reformer Josiah Wedgwood. Their debates brought together philosophy, arts, science and commerce, and as well as debating and discovering, the ‘Lunarticks’ also built canals and factories, launched balloons, named plants, gases and minerals, managed world-class businesses — and changed the face of England. Three centuries later, LUNÄ revisits this moment of historical significance. A produced facsimile of the original table where Lunar Men met, provides a context to speculate and expand on the possible topics the original society might have discussed and explore new ideas within these fields. Since January 2011 the table is used in different locations always around full moon for an ongoing series of critical discussions updating topics that occupied the Lunar Men as new scientific and industrial developments, but also art, education and social rights. Various topics that have been discussed are for example amongst others quantum physics, protest movements, environmental issues, neuroscience, science fiction, experimental education, the notion of progress, current topics in philosophy, the experience and representation of time, existential risks, mathematical modelling and cognitive computing. LUNÄ collapses the optimistically progressive value systems that were enthusiastically promoted during the Enlightenment into the mass production and globalised retail environment that can be seen as their legacy today. LUNÄ is a replica of the Lunar table located in the Soho House Museum in Birmingham combined with a set of eight IKEA chairs.